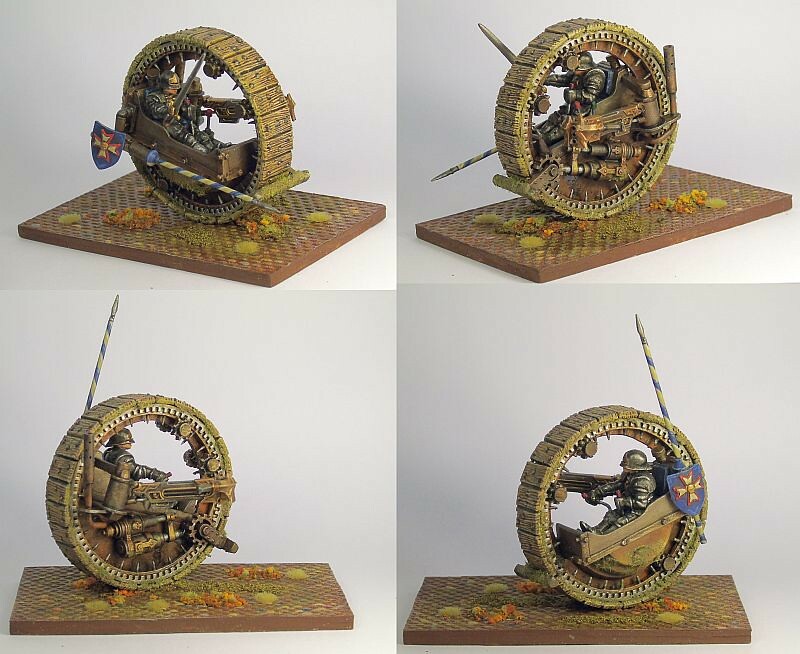 The Watch are completed and my other blog ‘By Jingo – Discworld at War’ had begun to deviate from its original intention, plus with its images hosted on Photobucket being unreliable it’s time for a rethink and new blog. The history and development of Discworld will unfortunately not progress – (spoiler alert) it has been left in a state of rapidly changing flux with the introduction of the industrial revolution via the steam engine. It is also well known that Terry was a fan of Steam-Punk so could this also have influenced the way things may have been developed. This blog will be a partial renewal of ‘By Jingo‘ as there are a number of units that I haven’t got round to building but I also have a number of ideas for units that while not official ‘Discworld’ I hope will fit its theme. 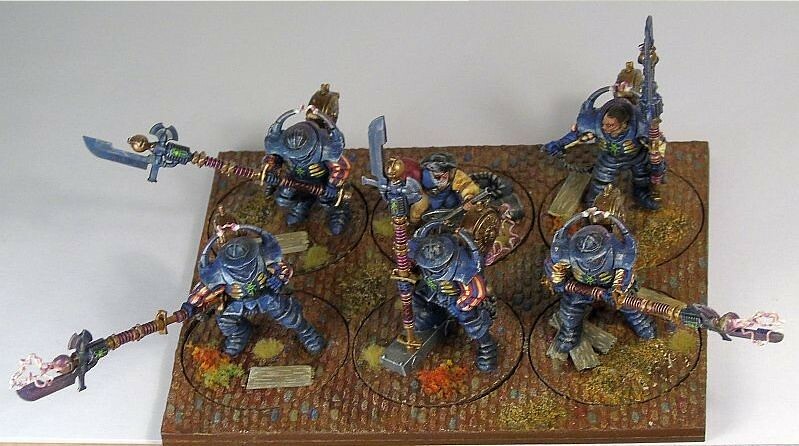 The ‘By Jingo’ units were also built to use as proxies for WFB rules but as I’ve not got into AoS the game rules may no longer affect my builds but will explain past limitations I’ve placed in the Basic Concept. Discworld is made up of many powerful nations and cities who have a history of fighting one another but even though (2nd spoiler alert) Jingo is about war little detail was given about the make-up of armies or the art of war other than to say armies consist of massed banners and spears with some use of horses. The Author’s descriptions didn’t help at times; there is a passage where Vimes is attacked by what his thoughts say is an Ankh-Morpork halberd but the book narrative first calls a pike, then states he dodges the blade. To me, and for the purposes of this work, a pike is a point on a 18’ stick, a halberd is an axe head on a 6’ stick and a spear is a point on a 6-12’ stick. Vime's dress uniforms had tights and slashed/puffy sleeves and the palace guards had feather/plumes in their helmets which is why I chose the Empire figures on which to base my models. A Gonne has been invented (and destroyed) so there are no black powder weapons – or ill-treating of swamp dragons. Leonard of Quirm and his inventions are a da Vinci take off and with the introduction of steam this allows a lot of opportunities for unusual units, some with a steam-punk influence but hopefully without resorting to lots of cogs, wheels or goggles. 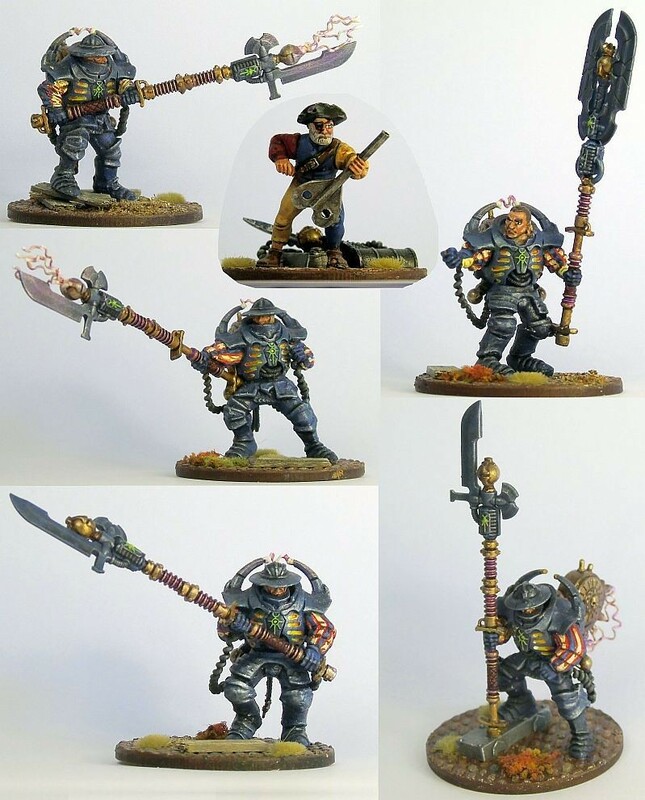 Over the next two months the local GW store is holding a Legion of Legend modelling/painting competition (basically some units and a leader) which I hope to enter using the above concept. This will be a start then I’ll see where I go from there. 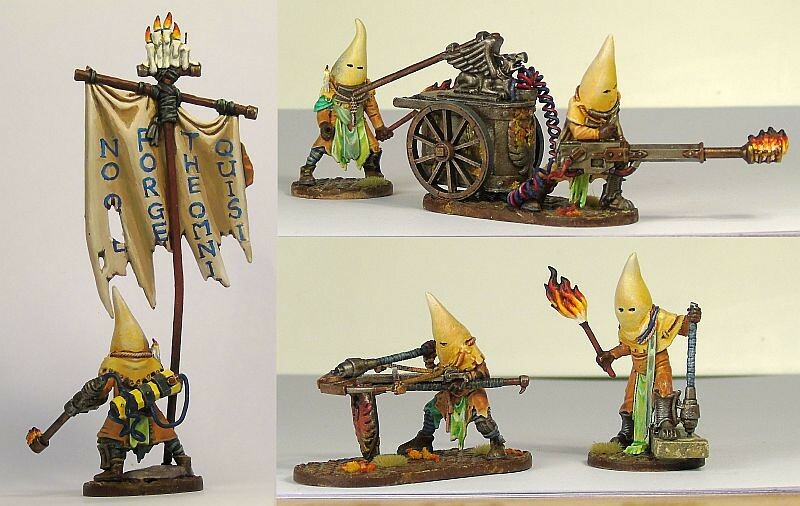 Re: Discworld Inspired - Lightning Lemons? 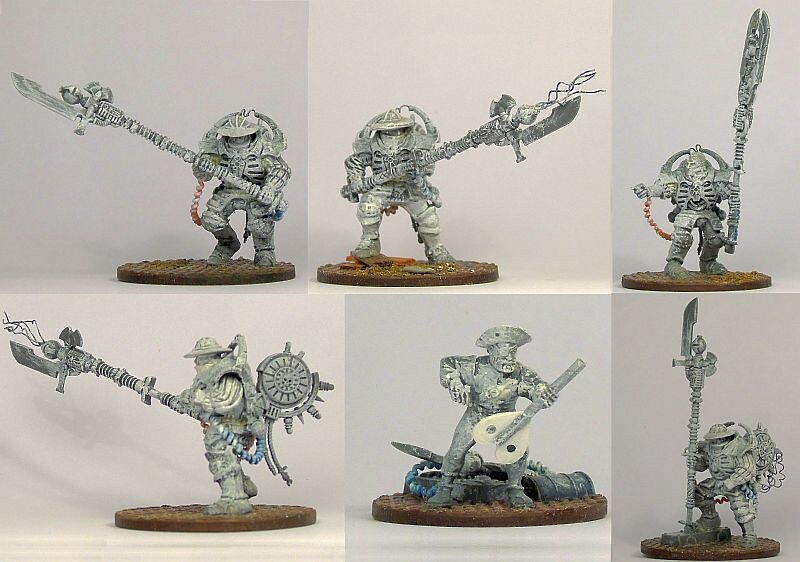 When the Fulgurite Electro-Priests originally came out my first thought was how can I convert them into a weapon worthy of Leonard. The snail backpack would become some sort of wind up/clockwork generator and the two half-moon ends of the poles would be joined together to form a halberd type blade at one end. I don’t know how it all evolved into this. Oh man Zak is that your first taste of Pratchett!? We need to get you hooked on the band wagon my friend. JAK that guy looks phenomenal. This is a type of model that I’ve wanted to make for some time after I was given a broken Skaven kit. The competition seemed a good excuse to start and basically after cleaning up both of the wheels I’ve just added bits of plastic card and other kits. 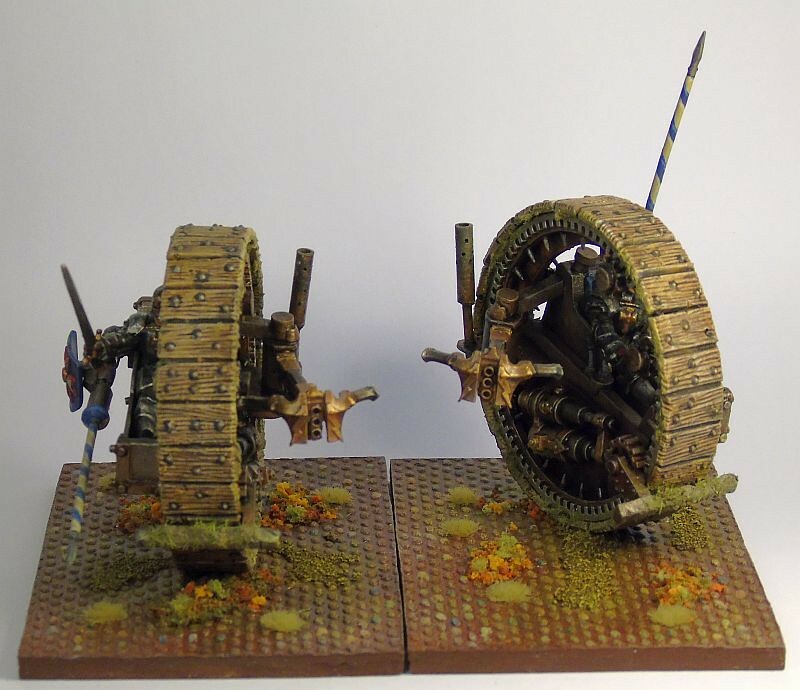 There is no precedent of this type of transport in the Discworld chronicles, not even a fragment of an idea from Leonard, but there was an incident with a machine of torture in Hades so I’ve no qualms about including them here. One of Leonard of Quirm’s experiments was to try and get lightning by sticking copper and zinc rods into lemons. His contemporaries said he was mad and even if he succeeded in getting tame lightning what use would it be. With a man of his obvious intelligence I think my interpretation is in itself quite tame as to what he could have achieved. As explained in the intro I’m no longer trying to fit these units to AoS rules so even I’m not sure what this weapon does; it could just be an electrified halberd but as we’re talking tame lightning it must have some form of a ranged attack. Pure genius at work there. Cthulhu for president, why Settle for the Lesser Evil? Omnia was at one time a religious state that only worshiped the Great God Om. The Devine Legion was its military army whose main job was to bring Om’s word to its neighbouring countries, usually by force. Internally the Quisition looked after the wellbeing of its citizens by expurgating sin and purifying the ungodly in the fires of the Qusition’s pit. 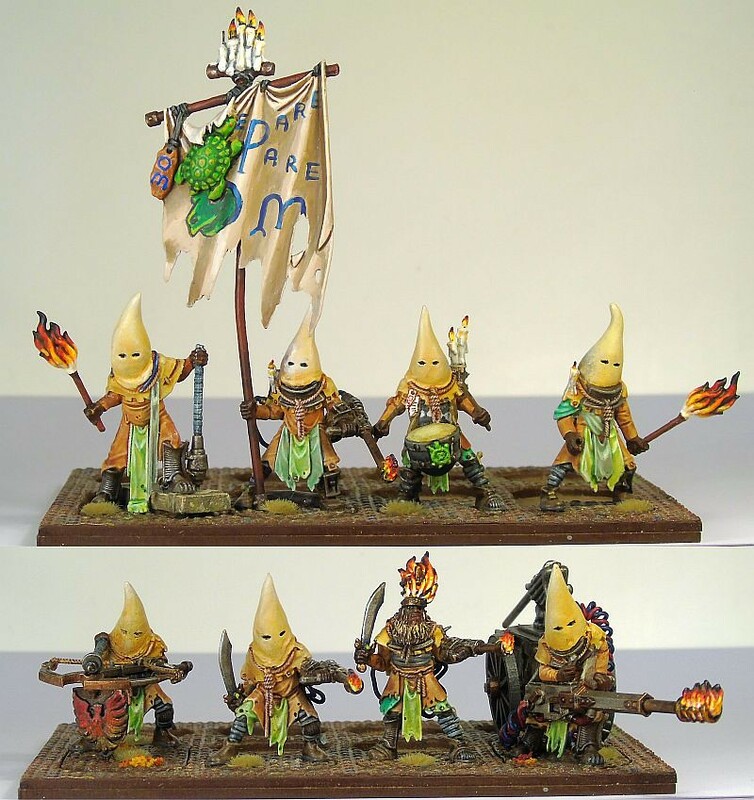 Remember the days when we were many and there were magnificent threads on converting models to all possible themes? I'm so glad someone still does this! 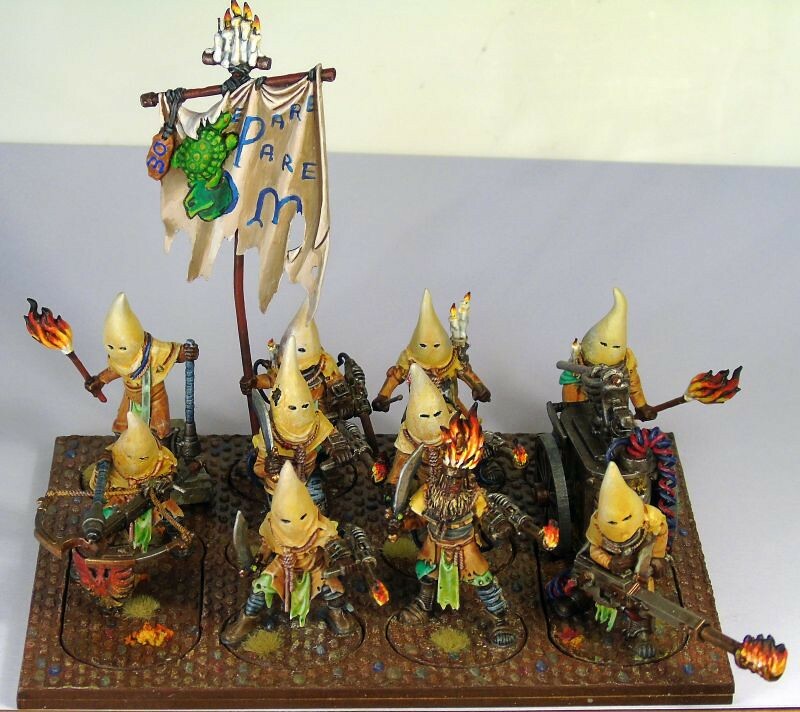 It's a great unit with great detail and story. Wow, that is totally wacked, and I love it. Steveb would've loved it too. That is so inventive, genious, well done! Love the hoods. Nicely done.